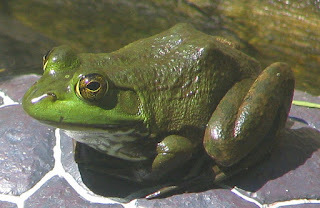 A large green bullfrog has been sitting by the side of a small pond (no more than 3 ft. in diameter) by the front entrance of the Light Omega Center for three days now. He does not move, but he has communicated with me in a very simple way when I asked him what he is doing there and what he needs. He told me that he is attracted to the water - both to the sound of the waterfall (operated by a pump), and to the water itself which creates the remembrance in him of 'home'. I wondered why he had found his way to such an isolated place without other wildlife or frogs for this remembrance, and asked him if he wanted to be moved elsewhere, but his answer was ambivalent - mostly, he was content to just be. Later on, I had the impression that he had come there to die. When I asked him about this he said: it may be so. The frog sits in an absolutely still, meditative pose all day. It seems that the energy here as well as the feeling and smell of the water is creating in him a sense of home and I am content to just leave him there. There is a heightened spiritual consciousness operating in certain animals that sets them apart from the rest of the species, making them more aware, more sensitive. This, I perceive to be the case with this frog. As I was thinking of writing about this, I came across a very simple and clear article about animal communication. What may seem very complex or mysterious is explained here in the language of life. Additional Note: It was necessary to drain and refill the little pond with fresh water in the last two days and the frog disappeared for a day while we did it. Today he is back again and I asked him again how he is and whether he wanted to be moved elsewhere. The frog answered clearly this time, that this was now his home and he was content to just be there. He also thanked me several times for my concern for his wellbeing. A sweet reminder of the appreciation of other life forms for the offering of acknowledgment. 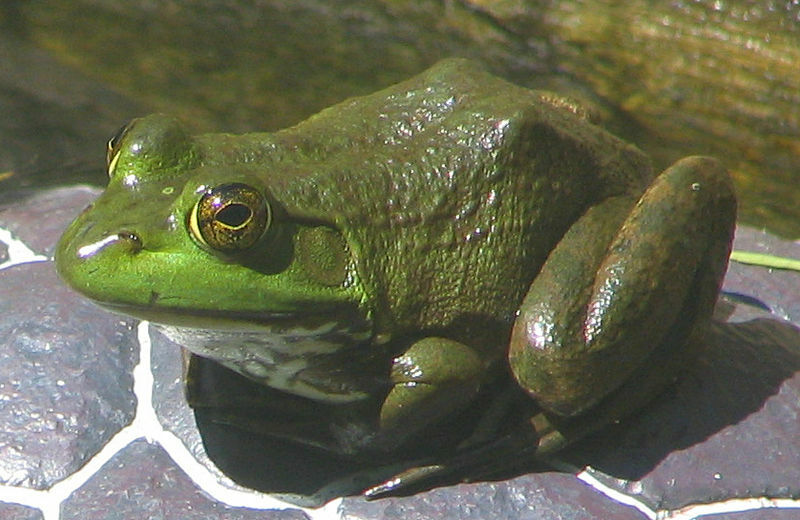 How wonderful to read of frogs visit and your communication with him! One of the first creatures to come back to our still torn area of the 7th Ward New Orleans, in our garden, was a frog. I knew his presence to be a blessing, this frog he was the first wildlife in a still devasted ecology to arrive and to bless and help in our garden. Sometimes late at night when I sit in the garden thinking, he will suddenly start croaking, interupting my thoughts, taking me back into the precious moment and my heart. When this happens, and it has happened more than once, I feel how this small creature is connecting with my vibration and the wonder of it! Thank you, Julie. I know I have said this often to you, but I love "our" frog - and I wanted to say it here as well. I feel so grateful for his presence, and love visiting with him. He has such a presence and I feel, that he has spoken to me (non-verbally) from the moment I met him. Thank you for this posting.